Are you ready for REAL CHANGE in your skin? If so, I encourage you to take just a moment and read this page. At InBalance, we can help you correct your skin issues and problems. Really. Our treatments and programs are SIMPLIFIED, AFFORDABLE, MEDICAL, and COMPREHENSIVE...and best of all, they really work! We can help you at InBalance - A Prescription for Healthy Skin, LLC. First, we will educate you on the truth about how your skin works. Knowledge is power. Then, we'll get you started on your journey to repair the damage and reveal your best skin ever! It's never too late. We will stay with you, as your personal medically-trained skin coaches, to address any concerns or issues that you may have as your skin changes. If nothing ever changed, there'd be no butterflies. You will learn how to make your dysfunctional skin functional. At last. Call us to set up an appointment for a consultation with our medically-trained staff, at (970) 217-2171. It's as easy as that to get started. Thank you for your interest, and we look forward to seeing you in our clinic at InBalance - A Prescription for Healthy Skin. We also specialize in treating ethnic and ultra-sensitive skin. InBalance is located on West Drake Road, in the Drake Professional Park on the Garden Level. 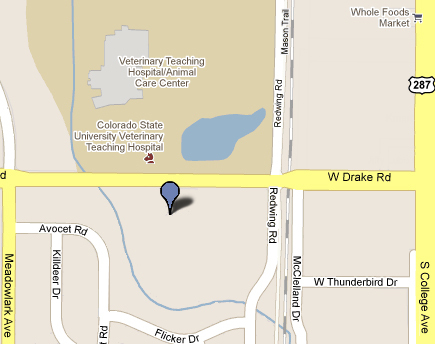 We are 2 blocks south of Whole Foods Market and 2 blocks west of College Avenue, directly across the street from the CSU Veterinary Hospital.